The elongated square cupola is the 18th Johnson solid (J19). It has 20 vertices and 18 faces (4 equilateral triangles, 13 squares, and 1 octagon). The elongated square cupola can be constructed by attaching an octagonal prism to a square cupola (J4), lengthening it; hence the name elongated. 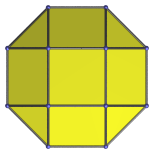 It can also be considered as a diminishing of the rhombicuboctahedron: the result of cutting off a square cupola from the latter. These coordinates are obtained by deleting 4 vertices from the rhombicuboctahedron.